Welcome to Samui Holiday Homes, specialising in private villa vacation rentals on Koh Samui, Thailand’s premier island destination in the gulf of Siam. Whether you’re visiting the island for a short holiday, extended vacation, or long-term stay, we have a wide range of homes and villas available to meet your individual needs. Samui Holiday Homes provide the ideal solution for intimate family holidays, corporate getaways, and reunions, in affordable luxury villas. Enjoy the privacy, comfort, and spaciousness of staying in a luxury home on this idyllic tropical island. From exotic jungle hideaways to fabulous beachfront villas, our property portfolio offers you the opportunity to ensure a perfect holiday on Samui. Not only is renting a home on Koh Samui simple, safe, and convenient with Samui Holiday Homes, but substantially cheaper than staying in a quality hotel, or renting a private villa in most other holiday destinations. When discovering your ideal environment, the obvious temptation is to create your dream home there. Increasing numbers of Samui-lovers have done just this, building their fantasy home away from home; a tropical refuge of beauty and serenity. 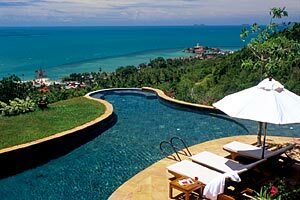 Samui Holiday Homes selected private villas feature some of Koh Samui’s most exciting locations. The dream of an absolute beachfront private villa, with views across white sands and shimmering blue seas, or a hilltop home, with vast panoramas stretching out in all directions, is now readily within your grasp. Design, furnishings, and landscaping are reflective of the ideal home. Fully equipped kitchens feature in all our properties, but for those of you who prefer not to cook on holiday, we have talented chefs on hand to cater to you. Alternatively, Koh Samui boasts a vast array of restaurants serving excellent international and Thai cuisine. Daily maid service is included with all our properties, and virtually any desire can be fulfilled in your private villa, from massage and spa treatments, to yoga, babysitting, or Thai cooking lessons. Although the warm, calm seas surrounding Koh Samui are perfect for swimming, snorkeling, and diving, most of our luxury villas also have private pools, from 20 metre lap pools to infinity-edged pools floating into views of blue skies and seas, where you can relax in total seclusion.